IADT & Boulder Media have announced a new Animation Graduate Programme, which launched in September 2018. In its inaugural year the Graduate Programme has six IADT graduate participants. They are working across different departments in the following roles: Animator, FX Artist, BG & Compositor. All are based in Boulder Media's Sandymount studio. The Graduate Programme also includes four masterclasses from in house subject matter experts at Boulder Media and six personal development modules that include: Working in a Studio Environment, Email Etiquette and Presentation Skills. Boulder Media is an Irish animation company based in Dublin. The company was established in 2000 and since then has grown to become one of Ireland’s largest animation studios. 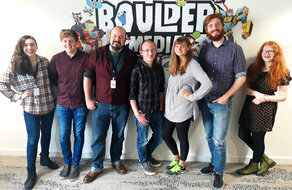 Boulder has been successful in attracting high profile projects from across the globe and has worked with leading broadcasters such as Nickelodeon, Cartoon Network, BBC, Disney UK and US. In 2016 the studio was acquired by Hasbro Inc., and is currently working on Transformers, Rescue Bots Academy, My Little Pony along with continuing to work with BBC on Dangermouse. The Graduate Programme provides an assigned 'buddy' to each graduate to support them with day to day questions. Across the six months programme the graduates will spend three months on two different shows. This will provide valuable experience and understanding of the challenges involved in moving between shows.